The new parking meters have a 1.5 hour limit. Photo by Regan Koster. The new parking meters outside of Metro Diner and Scotty’s Dawghouse along Sunset Avenue are now in use. 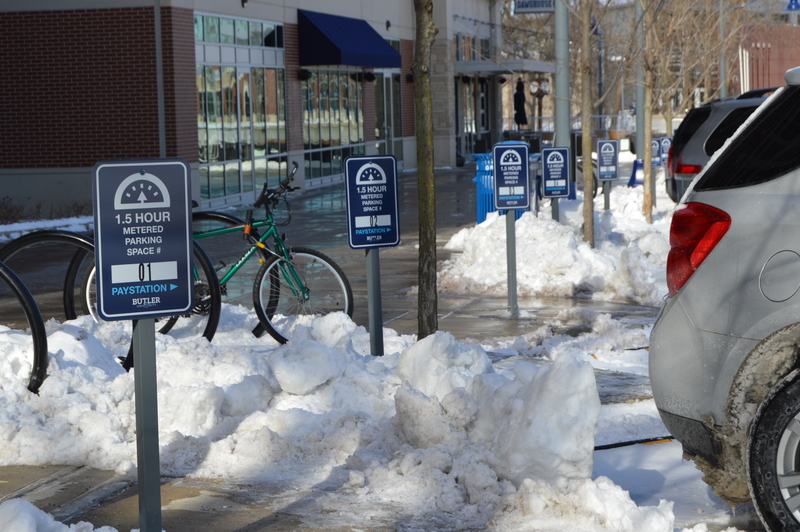 Installed earlier this year, the parking meters will be monitored and enforced by the Butler University Police Department. The location of the meters were strategically placed to emphasize that the spaces are meant to be used by patrons of both Metro Diner and Scotty’s for about 20 minutes, said Jeremy Moore, associate director of parking services. The meters utilize a multi-space pay station, where credit cards or coins can be used to pay to park. Students who currently have parking passes still have to pay the meter, Moore said. This policy is also outlined on the parking regulations section of Butler’s website. Student opinions have varied on the new meters. Many were not aware of the change to the parking situation, such as first-year pharmacy major Autumn Wobser. “We have new parking meters?” Wobser said. However, first-year biology major Mackenzie McQueen, said the new meters were unnecessary. “There is essentially no point to the parking meters when there is a parking garage right there,” McQueen said. Although citations for the parking spaces have just started, the meters have collected $200 so far. Moore said the metered parking spaces are being used as a trial run to determine whether or not more meters should be placed around campus. If the meters along Sunset Avenue prove to be successful, Moore said Butler’s campus may see an increase in pay-to-park spaces.